Hotel Terra Jackson Hole combines the four-diamond service, comfort, and technology of a chic urban boutique with an earth-friendly focus on the natural splendor of Jackson Hole, Wyoming. Twelve miles from the town of Jackson and less than a mile from Grand Teton National Park, the LEED Silver–certified property rests in Teton Village, beside the slopes of the world-renowned Jackson Hole Mountain Resort. The guest rooms and suites provide everything from radiant floor heating and all-natural Terra Beds to in-room recycling and chemical-free cleaning products. Even the fair-trade coffee and organic bath amenities reflect a sustainable policy well above the norm. The green consciousness extends to meetings and events as well. Designed to take full advantage of the views and natural light, the Murie Ballroom, Albright Room, and Craighead Boardroom join the Murie Patio and Infinity Pool Deck to bring the square footage for events up to 5,929. The hotel’s environmental awareness comes as second nature to Osteria Café and Il Villaggio Osteria, which both use organic, locally sourced ingredients. While the cafe features items like breakfast burritos, artisan pizza, and grab-and-go items, Il Villaggio Osteria serves lunch and dinner in the style of a Roman trattoria. The top-floor Chill Spa caps things off with six treatment rooms, a host of signature treatments using only organic products, a rooftop hot tub, and a quiet lounge taking in the big picture of Jackson Hole. JACKSON HOLE, Wyo. (July 05, 2017) – Teton Mountain Lodge & Spa and Hotel Terra Jackson Hole, managed by Noble House Hotels & Resorts in the heart of Jackson Hole’s Teton Village, are pleased to announce the appointment of Matt White as director of sales. In this role, White will oversee all sales strategies including developing the annual sales budget, showcasing meetings in the mountains to corporate meeting planners as well as continuing to grow Spur Catering and developing value-season programs for groups. With over 10 years of experience, White has held various sales and marketing roles with luxury brands, such as Hyatt Hotels, Preferred Real Estate, and Vail Resorts, Inc. He previously held the position of sales manager at the Hyatt Regency Chicago, where he was a member of Hyatt Hotel’s “sales team of the year.” During his time at Snake River Lodge & Spa as sales manager from 2008 to 2012, White was awarded “manager of the quarter” while exceeding 2009, 2010, and 2011 annual room night and revenue sales goals. Most recently, he was director of sales at The Wort Hotel in Jackson, Wyoming where he directed onsite group sales, catering, and marketing efforts, exceeding 2012-2015 group sales revenue goals. A graduate of Valparaiso University with a bachelor’s degree in Communications/Public Relations and Saint Xavier University with a master’s in business administration, White spends his free time as an adjunct instructor at Central Wyoming College, teaching hospitality sales and marketing. White is additionally a member of the Jackson Hole Chamber of Commerce’s Destination Sales and Marketing Committee. Along with Barker’s promotion, Noble House Hotels & Resorts also appoints Sally Brin to Hotel Manager of Teton Mountain Lodge & Spa and Will Farrow to Hotel Manager of Hotel Terra Jackson Hole. JACKSON HOLE, WY. (July 23, 2015) – With its recent expansion and acquisition of two luxury resorts in Teton Village, Noble House Hotels & Resorts, Ltd. – a collection of luxury hotels and resorts – has promoted Tyler Barker to area general manager of both LEED-Silver Certified Hotel Terra Jackson Hole and the AAA Four Diamond Teton Mountain Lodge & Spa. With Barker’s promotion, former Rooms Manager Sally Brin has also been promoted to Hotel Manager of Teton Mountain Lodge & Spa and seasoned hospitality veteran, William Farrow, has been hired as the Hotel Manager of Hotel Terra. As area general manager of Hotel Terra and Teton Mountain Lodge, Barker leads the overall brand growth strategy for both properties while overseeing all hotel operations with a core focus on service and the guest experience. Taking advantage of Jackson Hole’s year-round outdoor activities that include everything from world-class skiing and snowboarding, to trail running and fly fishing, Barker will continue to elevate the numerous adventure and luxury offerings, while still maintaining the distinctive qualities and lifestyles of each property. Prior to his promotion, Barker has lived in Jackson Hole for 16 years, including serving as general manager for Teton Mountain Lodge for the past eight years. Staying active as a vital role in the Teton Village lodging community and a veteran of the hospitality industry, Barker keeps a keen eye on industry trends and business news to maintain a strong presence in today’s competitive landscape. As general manager of Teton Mountain Lodge, Barker oversaw the opening of Spur Restaurant & Bar as well as the lobby’s recent redesign, successfully elevating the luxury guest experience and leading the resort to win multiple industry and travel awards. Long-time Jackson Hole resident, Sally Brin has been with Teton Mountain Lodge for the past five years as rooms manager. As hotel manager of Teton Mountain Lodge, Brin will oversee the concierge, sales teams, front office employees, guest relations and more. Brin’s combined knowledge and past experience with working at Teton Mountain Lodge will no doubt launch her to succeed as the Teton Mountain Lodge property manager. Will Farrow, hotel manager of Hotel Terra, joins the team having spent the past 15 years in various executive positions for The Inn at Jackson Hole, The Lodge at Tiburon, Topnotch Resort Hotel and Spa and The Beverly Wilshire, to name a few. With Farrow’s impressive experience in the hospitality industry, in his new role as hotel manager of Hotel Terra, Farrow will work alongside Barker to oversee all hotel operations and ensure that all goals are met. Located slopeside to the Jackson Hole Mountain Resort and at the gateway to Grand Teton National Park, the 132-room LEED-Silver Hotel Terra Jackson Hole was recently ranked #7 among the Best Resorts in the continental US as well as 30th place on the list of World’s Top 100 Hotels by readers of Travel+Leisure. Hotel Terra provides a contemporary approach to eco-mountain luxury with sustainable practices and a vibrant atmosphere creating an exceptional experience for their guests. From recycled steel, natural and organic mattresses to aluminum water bottles, the AAA Four Diamond hotel is consistently developing eco-friendly efforts to preserve and protect the environment. Hotel Terra is also home to the award winning Il Villaggio Osteria restaurant, popular breakfast Terra Café, a rooftop infinity pool overlooking Teton Village and the intimate Chill Spa located on the resort’s top floor. Teton Mountain Lodge & Spa, a AAA Four Diamond property in Teton Village, combines quiet elegance with the warmth and rustic details of a quintessential Jackson Hole lodge. The 145-room luxurious mountain haven recently enjoyed the highest place of all ski resort destination hotels with a 12th place ranking for Family Travel among continental US resorts by readers of Travel+Leisure. Teton Mountain Lodge boasts many family-friendly amenities like five hot tubs, indoor/outdoor pools, on-site ski rentals, and the award winning Solitude Spa Teton Mountain Lodge is also home to Spur Restaurant & Bar, a local favorite, with Executive Chef Kevin Humphreys, named Best Chef in Jackson seven years in a row. About Noble House Hotels & Resorts, Ltd.
Noble House Hotels & Resorts, Ltd. has been a privately held company for more than 30 years, originally founded in 1979 by owner Patrick R. Colee as a commercial property development group. Officially transitioned in 1994, this Seattle, Wash. based corporation owns and manages an upscale portfolio of 14 distinct and visually captivating properties spanning the four coastal corners of America with the newly refurbished Kona Kai Resort & Spa and Riviera Palm Springs in Calif., Little Palm Island Resort & Spa in the Florida Keys, and The Edgewater in Seattle, Wash. With a philosophy that emphasizes "location, distinction and soul," Noble House Hotels & Resorts exemplifies individuality, dedicating itself to creating and managing exceptional properties that contribute to their communities, stay true to local history, culture and ambiance. For more information, visit www.NobleHouseHotels.com or call Noble House Hotels & Resorts at 877.NOBLE.TRIP. Readers of Travel+Leisure named their fan-favorite properties and Hotel Terra Jackson Hole was ranked #7 among the Best Resorts in the Continental United States, #24 of the World’s Best Family Hotels and an overall ranking of #30 of the World’s Best 100 Hotels. The magazine’s annual World’s Best Awards reader’s choice survey is based on service, food, location, rooms, facilities and value. The questionnaire developed by the editors of Travel+Leisure was made available to their readers from early November, 2014 through March 2, 2015. Readers were invited to participate through the print magazine, tablet editions, newsletters, social media and online. The annual World’s Best Awards has been ranking their reader’s favorite hotels and resorts for two decades and provides clear insight into the trends and tastes shaping the global travel community. Located slopeside to the Jackson Hole Mountain Resort and at the gateway to Grand Teton National Park, the 132-room LEED-Silver Certified Hotel Terra Jackson Hole provides a contemporary approach to eco-mountain luxury with sustainable practices and a vibrant atmosphere to create an exceptional experience for their guests. From recycled steel, natural and organic mattresses to aluminum water bottles, Hotel Terra is consistently developing eco-friendly efforts to preserve and protect the environment. Hotel Terra is also home to the award winning Il Villaggio Osteria restaurant, a rooftop infinity pool overlooking Teton Village and the elegant, intimate Chill Spa located on the resort’s top floor. Seattle, Wash.- Noble House Hotels & Resorts, Ltd.- a collection of luxury hotels and resorts- has acquired Teton Mountain Lodge and Hotel Terra and will immediately assume management of both properties, located in Jackson Hole, Wyoming. The resorts bring the Noble House Hotels & Resorts (NHHR) distinctive hospitality portfolio to 16 properties, and represent the brand's ongoing growth in the adventure and ski-focused space. "These two resorts, known for their upscale, rugged luxury, are a perfect complement to our portfolio of true-to-place lifestyle hotels," said Pat Colee, Noble House Founder and Chairman of the Board. "In addition to being perennially ranked as No. 1 ski destination, Jackson Hole is a year-round adventure destination and naturally appeals to the Noble House Hotels & Resorts guest." Located slopeside to the Jackson Hole Mountain Resort and at the gateway to Grand Teton National Park, 132-room Hotel Terra is LEEDS Silver Certified and a AAA Four Diamond luxury hotel, providing a contemporary approach to sustainable practices. From fluorescent light bulbs to recycled steel, natural and organic mattresses to aluminum water bottles, Hotel Terra is consistently developing eco-friendly efforts to preserve and protect the environment. Locally beloved Hotel Terra's amenities include two upscale restaurants, a lounge, an infinity pool and a rooftop spa. 145-room Teton Mountain Lodge & Spa, a AAA Four Diamond, award-winning property in Teton Village, combines quiet elegance with the warmth and rustic details of a quintessential Jackson Hole lodge. Located slopeside, it's just steps from the entrance to Grand Teton National Park, and a short drive to Yellowstone National Park. The Lodge has every amenity for the adventure traveler looking for a luxurious mountain haven. With five hot tubs, two pools and an expansive fitness center, the award winning Solitude Spa is the perfect place to unwind after a day of skiing or hiking. The Lodge is also home to Spur Restaurant &Bar, with Executive Chef Kevin Humphreys, named Best Chef in Jackson five years in a row. Located in the center of the Greater Yellowstone Ecosystem (the largest continuous temperate ecosystem in the world) Hotel Terra also enjoys a prime slopeside proximity to the Jackson Hole Mountain Resort and resides just a mile from the Grand Teton National Park. As one of the few luxury hotels in this legendary natural landscape, the Hotel's effort to become LEED certified seemed like a natural progression, according to TRG President Jamie Yarrow. "We're proud to start this process of 'greening the hotel industry' with this first Hotel Terra in Jackson Hole," says Yarrow. "We draw inspiration from these pristine spaces all around us. There's no forgetting what's at stake." Elements of Hotel Terra that helped earned the LEED certification include everything from Low VOC (Volatile Organic Compound) carpets and pads, paint, and adhesives to energy efficient heating and cooling systems that target specific zones within the hotel, water conservation systems such as dual flush toilets and low flow faucets, as well as use of recycled or reclaimed materials in everything from the roof shingles to the building's steel and cement structure. The Hotel expands their eco efforts beyond the LEED certified building however, under the direction of the Corporate Director of Sustainability, Ashley Morgan, who directs all purchasing and vendor relationships for the hotel, reviewing products and partner companies carefully to ensure the most responsible steps are taken and that the company remains true to its philosophies and goals. "A big part of what we're trying to do is show that luxury and indulgence can also be sustainable," Says Morgan. "For us LEED is a big accomplishment, one which we hope to build on as we continue to grow our collection." Formed in November 2006, Terra Resort Group boasts a highly credentialed pedigree of operational and business talent. Company President Jamie Yarrow calls on 18 years of experience with Four Seasons Hotels and Resorts, most recently as General Manager of Four Seasons Palm Beach, and previously, leading the opening management team for Four Seasons Resort Jackson Hole. Several industry veterans joined Yarrow's Terra Resort Group team, lending an innate understanding of intuitive service and seamless operations. Rob DesLauriers, Chairman of Terra Resort Group and the developer of Hotel Terra, is a former professional skier turned developer and hotelier. Among other successes, DesLauriers launched the adjacent slope side Teton Mountain Lodge & Spa in 2002, a 145 room luxury hotel that emulates the great park lodges of the American West, also a member of Terra Resort Group. 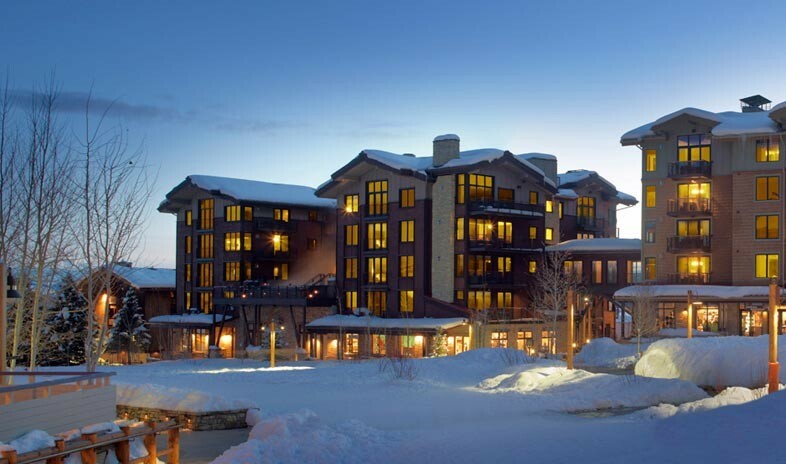 Terra Resort Group also operated the neighboring Inn at Jackson Hole, formerly a Best Western property, considered to be the best slope side value in the Jackson Hole market. Terra Resort Group's values as a company are firmly grounded in environmental responsibility and an evolutionary approach to hospitality, where excellence and innovation works with conscientious business practices and forward-thinking design to create an exceptional guest experience.